In which E challenges me to veganise Cornish fishhead pie known as Stargazy Pie and I can't find how it was featured in Pie the Sky but we loved the pie anyway. Television show: Pie in the Sky, crime drama, UK, 1994 - 1997. Both my parents and my in-laws love to watch crime and police drama at the gentler end of the spectrum, usually British. While I now enjoy watching these dramas, I suspect this is born of sitting watching Hill Street Blues, Midsomer Murders, Pie in the Sky, Dalziel and Pascoe etc with my parents and likewise, watching a bundle of similar dramas with my in-laws when I live in Scotland. The 'detectives' come from a whole range of roles: policemen (Dalziel and Pascoe), retired policemen (New Tricks) private eyes (The Last Detective), psychics (Medium), ladies who lunch (Miss Fisher's Murder Mysteries), gardeners (Rosemary and Thyme), high school girls (Veronica Mars), writers (Murder She Wrote), nice old ladies (Agatha Christie's Marple), spies (Spooks), cleaners (Mr and Mrs Murder), forensic pathologists (Silent Witness), priests (Father Brown), dogs (Inspector Rex), magicians (Jonathan Creek), judges (Judge John Deed), recluses (Monk), They are always passionate and often loners fighting the system. I would love to see a comedy spoof this premise with everyone involved in the case being the detective. Pie in the Sky is typical of such shows. It is about Henry Crabbe a policeman who planned to retire and indulge his passions in running a restaurant but is kept on as a detective in a casual fashion after retiring. I wish I could remember it better. My memories of Midsomer Murders is fresher and I would have liked to have included one of their quirky murders (poisoned by tagliatelle with pesto, drowned in a cauldron of tomato soup, crushed against towers of bottled sauce, run over by the milk van or crushed by a giant wheel of cheese)! However there was the stargazy pie challenge. 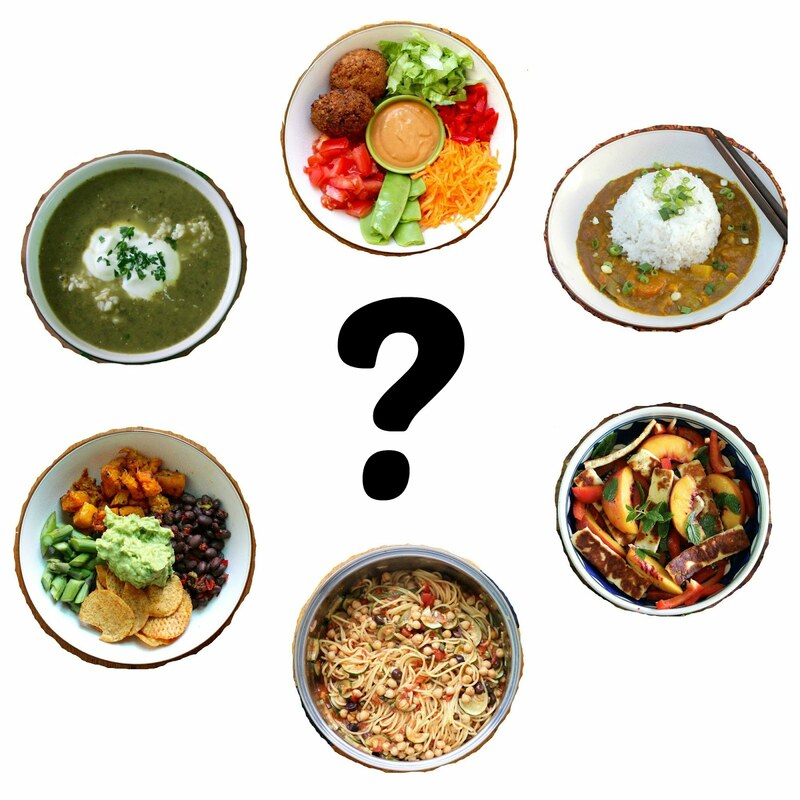 I confess I really played fast and loose with my Vegan MoFo theme of TV Dinners on this post. E sent me an email challenging me to veganise a Stargazy Pie. I searched for a connection with a television show and found it had been featured on Pie in the Sky. As it happens, I enjoyed watching the series but it was a long time ago. All I could find online was that it was used for a humourous moment in the episode called The Policeman's Daughter. Stargazy pie is a traditional Cornish fish pie whose origins hark back to the village of Mousehole where legend has it that local fisherman and hero Tom Bawcock caught a large haul of fish on a stormy night, enough to feed all the village. Each year on 23 December Tom Bawcock's Eve festival is celebrated in Mousehole with Stargazy Pie. 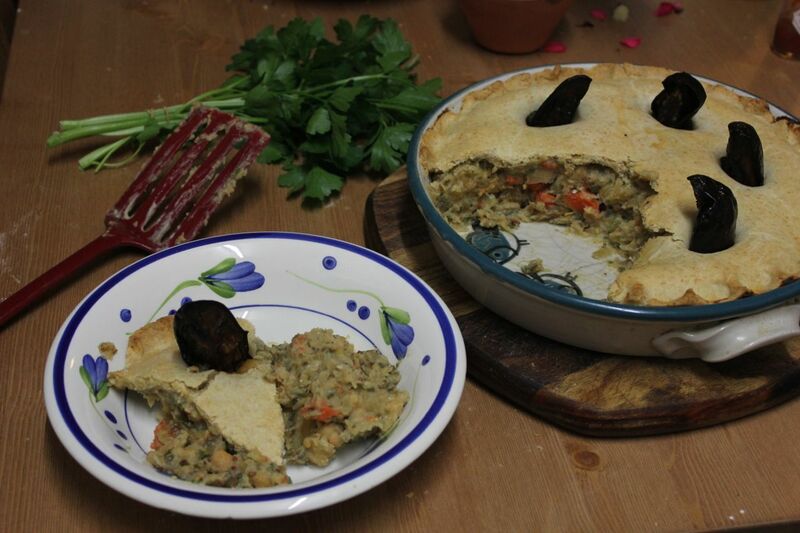 The iconic pie is full of fish and, depending on the recipe, eggs, potatoes and bacon. Fish heads poke out of the pastry, gazing at the stars. Quite a challenge to veganise. As soon as E suggested it, my thought was to roast eggplants and have them poking out of the pie instead of fish. This was what I did and it worked well. I find eggplants easier to look at than fish heads, never mind that they are tastier. It was also a nice irony that E dislikes eggplants so he was hoisted on his own pitard! Thinking about the fishy filling was harder still. I never liked fish anyway. 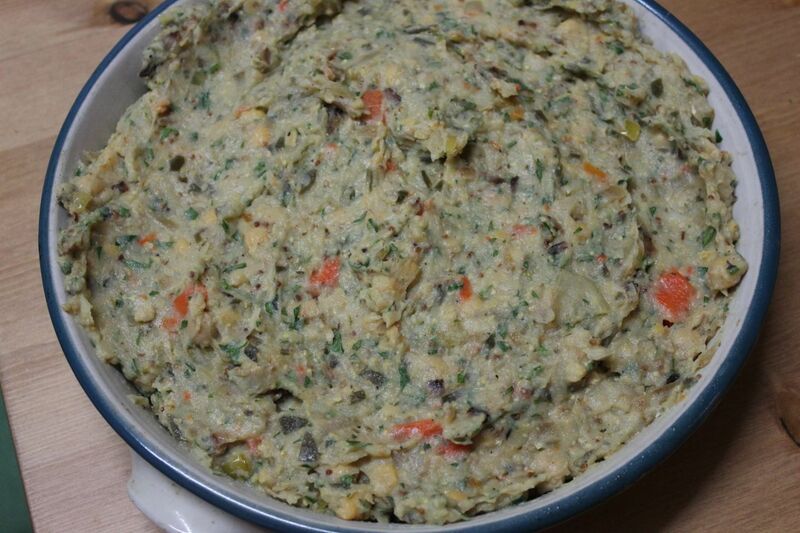 I looked up fishy recipes such as mock tuna salad, chesapeake tempeh cakes, and old bay tofu cakes. Potato and chickpea were definitely in. I decided upon tempeh bacon (my nemesis) partly because I had no tofu and partly because tempeh can be a little fishy. It was one of my best attempts at tempeh bacon - adapted from kblog. I added seaweed - kombu. I had to make a vegan pastry and one from Lavender and Lovage worked well though it didn't get as golden brown as I had envisaged. I found a few white sauce recipes at BBC Good Food and ehow. One had sour cream so I used a previous vegan sour cream recipe for inspiration. Thinking it through was a lot of work and writing the recipe up was quite an effort too. If you do decide to make this pie, I highly recommend that, as I did, you do so on the day of an election when you need distraction from depressing politics. It was only later I noticed what I had done but I suspect there was some sort of subconscious plan at work. Who wants to see the endgame of an election campaign that was nothing to be proud of - just "suppositories of wisdom", "selfies", and "does this guy ever shut up". I was also helped by E who showed Sylvia the video of grumpy cat a few times to make sure she was kept away from my crazy cooking project. She ate her dinner and was in bed before E and I tucked into a piece of pie in front of the election coverage. The pie was definitely superior to the telly. 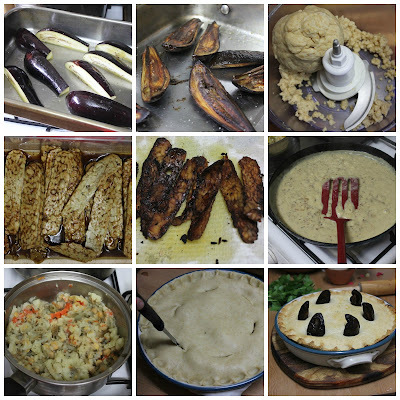 The eggplant "fish heads" looks cute and impressive, and the filling had a slight fishy taste. Mind you, I say that as someone who hasn't eaten fish for 20 years. The main downside is that it was fairly messy to serve. I still was rather proud of my creation. 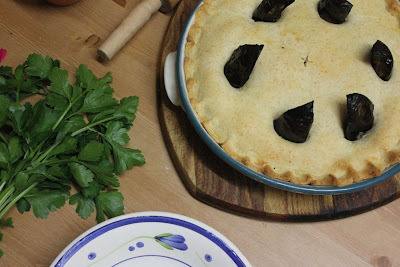 While this pie has a long ingredient list, I was pleased that it gave me an opportunity to use up a lot of food hanging around the house: silken tofu and tempeh that were nearing best before dates, wine that was taking up room in the fridge, lemons from my mum's tree and herbs I was given at a community garden that day. With that in mind, I am sending this pie to Elizabeth's Kitchen for her No Waste Food Challenge (co-hosted with Kate from Turquoise Lemons). To roast the eggplants: trim the top off and cut vertically into quarters. Splosh some olive oil into a roasting tin, throw in a pinch of salt and put the eggplants into the tin. Whirl them around and use a pastry brush to check they are covered with oil. Roast until the flesh is golden brown and feels soft when gently poked and the skin is crisp. I roasted mine at 140 C for an hour because I forgot to check the temperature and was chatting to a neighbour, then I put the temperature up to 210 - 220 C and roasted another 45 minutes until done. Set aside. [I only used 6 quarters but I think it is worth doing 8 in case you have any dodgy ones.] They will be easier to handle if cooled. To cook potatoes and carrots: place all ingredients into a large saucepan and add enough water to just cover the vegetables. Cover, bring to the boil and simmer for about 20 minutes or until soft when poked with a fork or knife. Drain and take out the kombu. Finely chop the kombu and return to the vegetables. Set aside. To make tempeh bacon: firstly make marinade by mixing all ingredients except the tempeh and the rice bran oil. Slice tempeh into strips as thin as possible. Alternately drizzle marinade and lay tempah slices into a large shallow container. Leave for a few minutes so that the marinade soaks in. Heat 1-2 tsp of rice bran oil over high heat in a non stick heavy based frypan. Place as much tempeh as possible in the frypan without any slices overlapping. Fry until slightly charred and crispy on each side - I think this took me between 3-5 minutes per side but it took less for kblog. I only used half the batch in the pie partly because I only used as much as I could fit in my frypan. Finely chop and set aside. To make the pastry: mix butter, flour and pinch of salt in the food processor to resemble coarse breadcrumbs. Add water, 1 tablespoon at a time until the mixture comes together into a ball in the food processor. Wrap in clingwrap and chill in fridge for at least 30 minutes. To make the white sauce: place all ingredients except onion, oil and flour into a blender and process until you have a smooth mixture. [NB My blender is my little one that attaches to my hand held blender so I blender everything but only added a bit of the wine and then transferred to a bigger blow and mixed in the rest of the wine by hand.] Set aside and fry onions in rice bran oil until golden brown. Scatter with flour and cook gently for a few minutes until flour smells nutty or colours slightly. 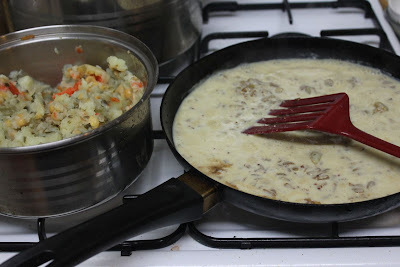 Add white wine mixture and cook until the mixture thickens. To put together filling: first roughly mash the potato mixture with the chickpeas. Stir in the white sauce, chopped tempeh bacon, herbs and salt to taste. Set aside. To assemble: preheat oven to 200 C. Roll out the pastry to about and roll half the pastry out into a circle to fit a 25cm pie dish. (I guess it was about 0.5cm thick.) Light grease a 25cm diameter pie dish and spoon filling in. Use the back of the spoon to smooth it down. 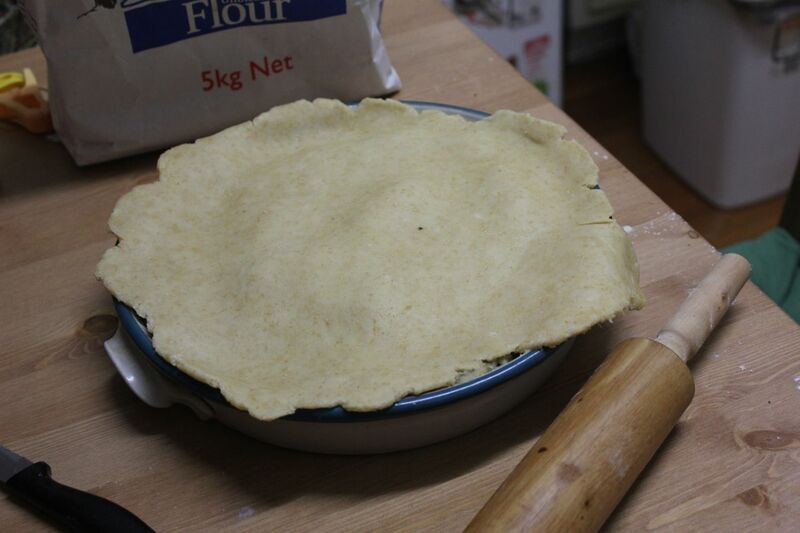 Place the pastry over the pie dish and trim to fit. Pinch the pastry dough around the sides to look pretty and to push it into place. Use a sharp knife to make 6 slits in the pastry. Now use your finger to slightly expand the opening. Push a roasted eggplant into each slit with the pointy end sticking upwards. Brush pastry with soymilk to glaze it. Make another slit in the middle of the pastry with a sharp knife for ventilation. Bake for 45 minutes or until pastry is golden brown and cooked. To serve, cut into wedges, preferably with an eggplant 'fishhead' on each wedge. 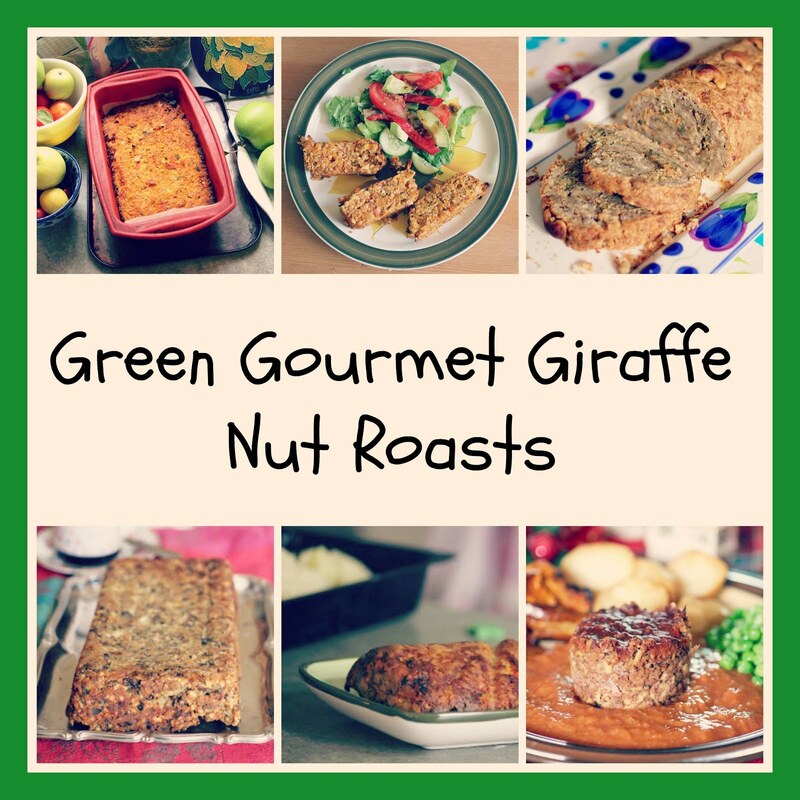 This post is part of Vegan Month of Food September 2013. 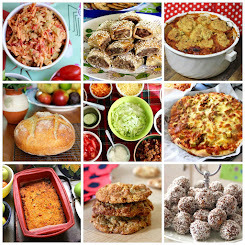 This year for Vegan MoFo I am cooking recipes inspired by some favourite tv shows - and veering off topic occasionally. 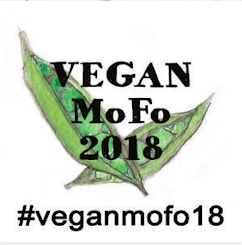 Go to my Vegan MoFo list for more of my Vegan MoFo posts. The list of ingredients gives me a headache because I am inherently lazy in the kitchen these days, but WOOOOOOT VERONICA MARS! wow!!! What an impressive pie! Now that is smart! 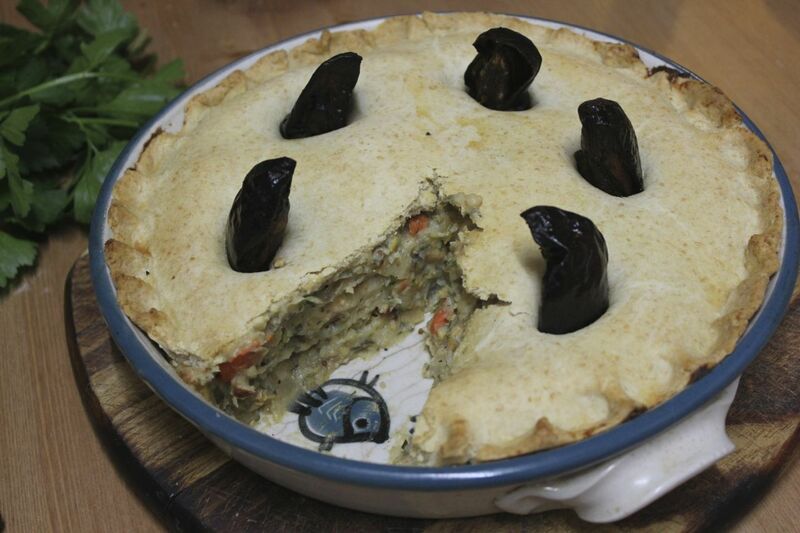 I was always puzzled who would want to eat the actual stargazy pie with the fishheads in it, whereas this looks both cute and tasty. 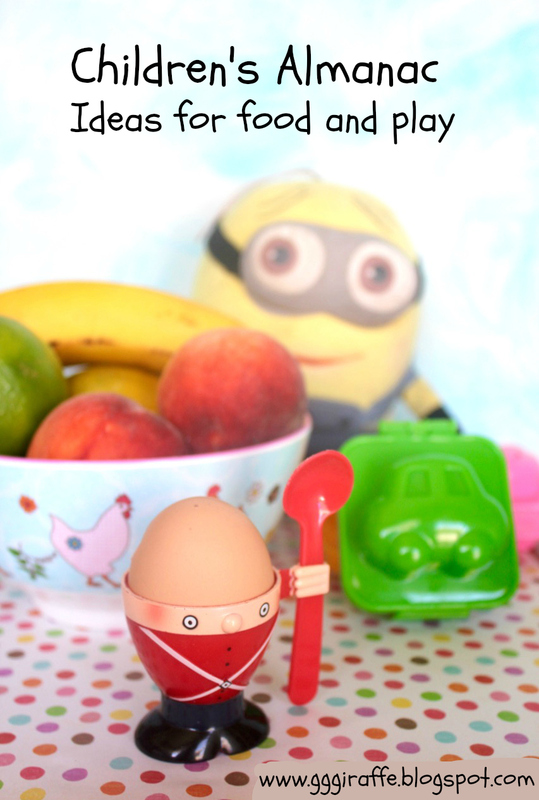 Eggplants are the way forward! I am so glad you got to making this! It looks incredible but definitely complicated and good for a day when you want kitchen distractions. What a great effort Johanna. I'm so happy that this epic meal worked out for you - the eggplants poking out of the pie look fantastic! Great that this used up so much fridge produce and I hope the pie leftovers fared well after all of your efforts in making this. I had never heard of stargazy pie previously. This is so creative! The aubergine ends sticking out looked like penguins to me!! It looks really tasty too. I do like a good, hearty pie. I've only ever used kombu to cook my beans with, never actually eaten it, but again great idea for some fishy flavour. I have lovely memories of watching murder mysteries as a family when I was growing up. Midsomer Murders and Jonathan Creek especially. Thanks for the nostalgia! I love your mock meals. They make me feel all creative :) I am not sure that I have eaten a fish pie before so I want to try this one and see what all the hype is about. Ah wasn't the election a buzz kill. At least you had pie to get you through! Oh wow Johanna, you are amazing or should I say a ... star? I've never attempted any sort of stargazey pie, I'm not even sure I've ever seen a real one. But they are iconic down here, so you've completely put me to shame. 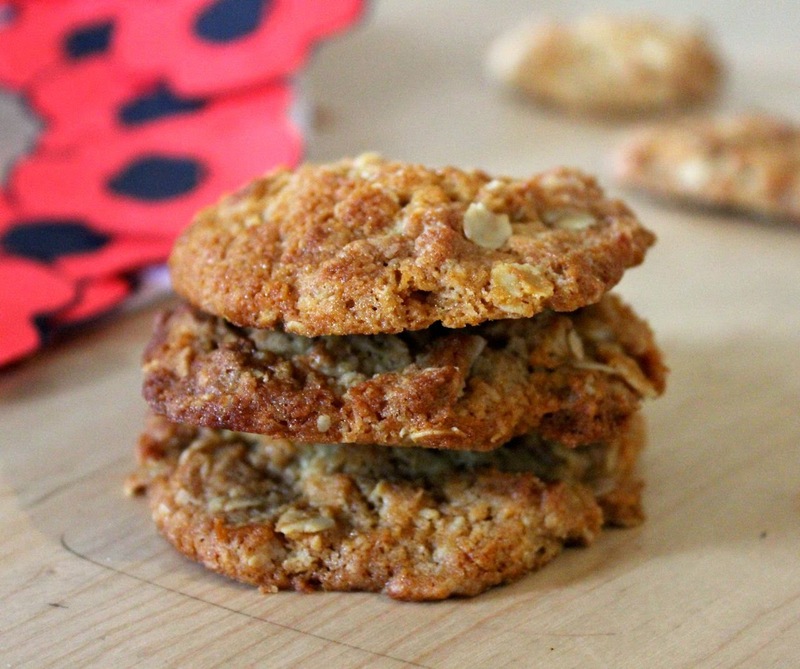 Think I would infinitely prefer your version, especially as I love tempeh.